I have been meaning to post this since my birthday, but I never got around to it. So, I thought today it would make a great show and tell. My kids each made me a homemade card or note for my birthday last month. They always do this. I really enjoy this and they are such sweet notes. This year though my 8 year old daughter gave me an extra sweet note. 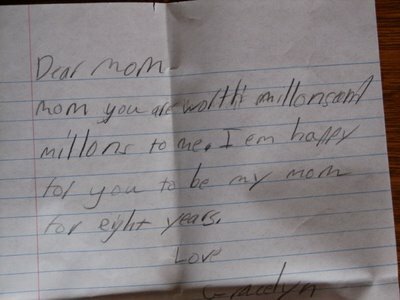 It says: Mom you are worth millions and millions to me. I am happy for you to be my mom for eight years. Notes like this make it all worth it. It is so easy to get discouraged with the every day tasks we face as parents. So much of the every day work goes unnoticed and unappreciated from our kids. I know I did not appreciate all my parents did for me. This note came on my birthday which was after I had a long week dealing with sick kids, a messy house, and the rest that goes along with every day life. I guess my daughter knew I needed a little encouragement. She sure gave me some. This note is going in my save pile and I will always treasure it. Her note is better then any Hallmark card. It’s just as you said…this reminds you that it is all worth all you do, give, love. I hope you have a fabulous day and hugs to your precious kiddos. Awwww! That is so sweet! Puts things into perspective doesn’t it! Notes like that from your children let you know you are doing a good job being their mom! Precious note. I know you treasure it now, but trust me, its worth increases with each passing year! What a wonderful blessing, both in your daughter, and that she can articulate what she feels for you. You are truly blessed, and so must she be – you must be a great Mum for her to say that! I hope that I can be just as good a Mum to my little one as you are to yours! That is just a precious keepsake. I have kept my girls notes when young and some of their cards now that they are married. Hang on to those and reflect back from time to time while re-reading them. Save this; it’ll grow even more precious as time passes. How wonderful! That’s one to save forever! My boys make me cards and I save them! I love it! You should bring a recipe over to my “Tasty Tuesday!” It looks like you have a few! That is the sweetest and cutest note I have ever seen! I just stopped by on my way through the list of all the nice ladies who shared today. But I had to stop and comment on such a sweet note. How proud you must be. i love notes like this :O). i have a few saved from my kids also. one of my favorite ones is of the first time my daughter drew a cat. it was pretty awesome! and i have a note saved from my son when he knew i was going through some hard times at work. he compared me to cheer bear with the care bears. i still have it and love it. thanks for sharing your note! You are always welcome at The Shadow of the Cross. Feel free to visit anytime. Thanks for your comment! I think I found that Dino Lego set at Toysrus? When I checked it out, later, on lego.com, I think I noticed that it’s fairly new, so maybe it hasn’t hit all of the stores yet. Hope you can find it!